Thanks for joining me in revisiting our recent trip. I’m afraid Frozen is going to invade the Pensieve. During our second day at Walt Disney World, we visited Disney’s Hollywood Studios. While there, we did several things, we rode Star Tours 3 times in a row, had lunch at the 50s Prime Time Café among other things. We had a Fastpass for a new attraction at the Studios: “For The First Time in Forever: A Frozen Sing A Long”, that the kids didn’t know about. We managed to find the location of the event, it was near the Muppets 3-D show, but in a building we had never been in before. We joined the long FastPass line and soon they began letting everyone in. For those that don’t know, I’ll let you know exactly what this attraction is. First, they let all the Fastpass holders into the building. It was a large auditorium-like building with stadium seating, like a theater. Then they let the Standby people in. Soon, you’re in this building with a few hundred of your closest Disney friend and a lot of little girls. 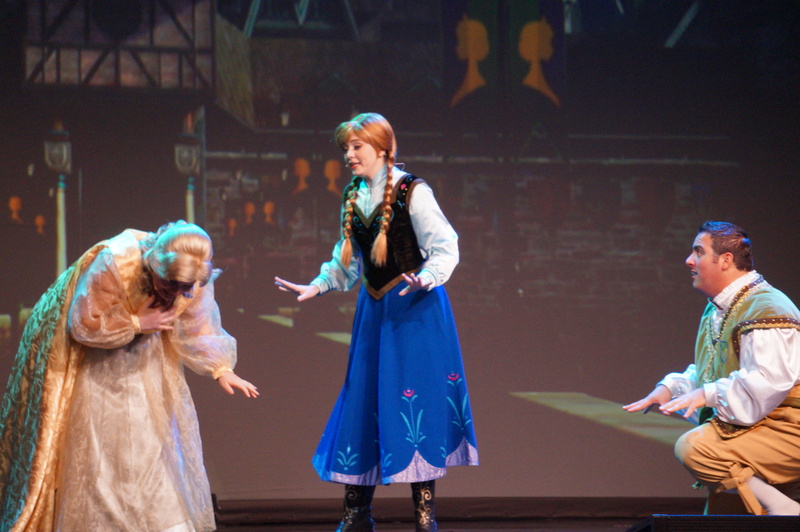 The show starts with Princess Anna introducing the 2 new Arrendale historians. They take the show from there and are quite funny. 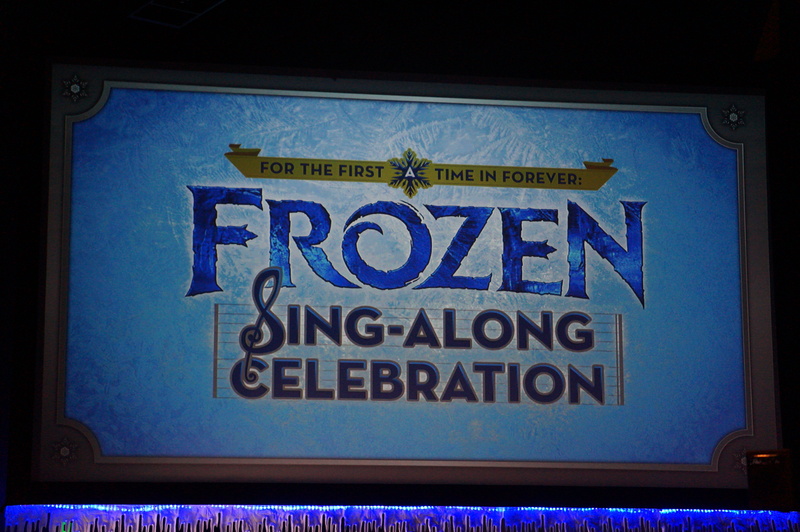 The historians recount the story of Frozen with clips from the movie and full-length sing along versions of the musical numbers shown on a large projection screen. 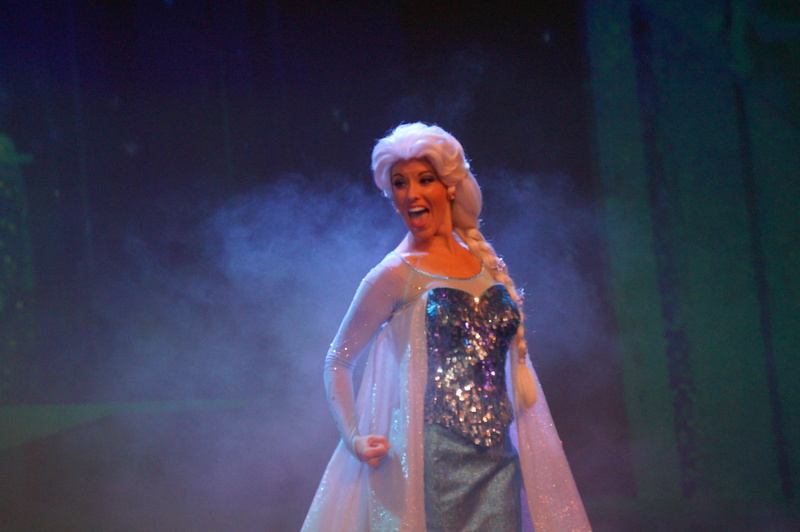 Eventually, Queen Elsa shows up and makes it snow inside the building for the finale. If you have little ones that are obsessed with Frozen, this is definitely the one attraction in Disney’s Hollywood Studios you have to take them to. I think soon, if not already, Disney was going to move this attraction to the recently-vacated American Idol Experience theater, so you should be able to find it there. If you can get a Fastpass for this show, you should definitely do so as it is very popular. I hope you enjoyed singing along with us to Frozen. And finally, if there’s a particular attraction you’d like to experience with us, please send an email to bob@wdwpensieve.com. Also, a bit of housekeeping news. I just recently acquired the domain of www.wdwpensieve.com along with hosting services. In the very near future, I’ll be moving this podcast from our current provider at Podomatic to the new site. For those of you who subscribe to this podcast, that means I may lose you as subscribers, but I hope you’ll follow me to the new site and subscribe again. I’ve already changed the feed address with Stitcher without losing any subscribers, so those subscribers are getting the new feed of the podcast. I’ll be changing it with iTunes very soon. Please check out the new website at wdwpensieve.com and give me any feedback on the site that you may have. I’m trying to put some other articles up on it to provide items you won’t get from the podcast. Well, that will do it for memory thread number 7 in the WDW Pensieve. Once again, I appreciate you sharing our memories with us. Previous PostRandom Acts of Disney KindnessNext PostHappy Birthday Donald Duck!